In order to get your architecture products used often by key stakeholders and in projects, practice has shown that architecture products which are fully documented and meet standards are more likely to be used. 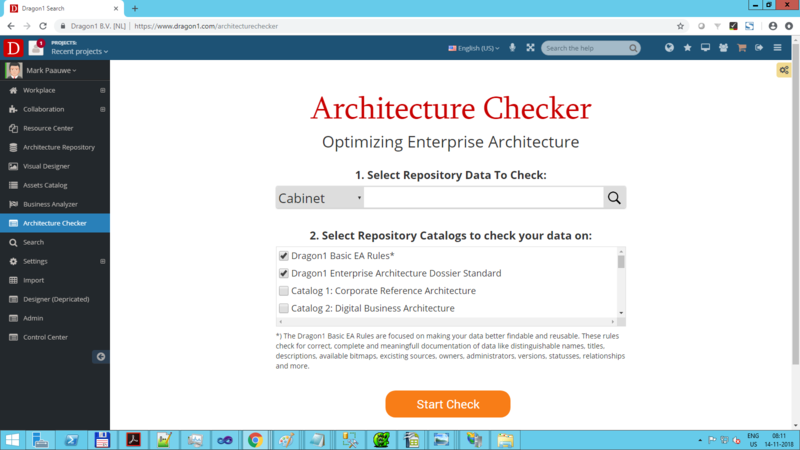 To make it easy to optimize your Enterprise Architecture data for usage, Dragon1 provides you with the Architecture Checker. The Architecture Checker works simple with only two buttons and one select list. First, you need to have data entered in repository cabinets in your account, or you need to have an XML file or CSV file with data uploaded. If this is the case you are ready to go to the Architecture Checker by clicking the corresponding menu item at the left of your screen. Select a cabinet with data in your account, or upload a file with architecture data. Select a catalog with certain principles and rules that should be used to check for. Click on the orange Start Check button. Use the generated report to fix the errors, warning and hints. If you are working with Enterprise Architecture you will probably also have in the organization a list of Architecture Principles, standards or policy rules. As a user of Dragon1 you can enter this data in the Architecture Repository and create a catalog (a managed list) with it. Once given the status approved, you can mark that the catalog should be shown in the selection list of the Architecture Checker. In this way, you can have your data, for instance, solution designs, checked against your own catalogs, for instance, your architecture principles.